The FunMouse information hub is a treasure trove of information on how you use your mouse. The hub displays information such as the distance you have travelled with your mouse, the amount of left clicks, amount of right clicks, all clicks combined as well as how long ago you switched your computer on. Except for how long your computer has been running all other information is displayed for the current day as well as the total since FunMouse started recording this information. You can configure the information hub to display data using metric or imperial measurement units. This can be configured on the settings tab of the FunMouse settings program. Displays the system uptime since the last reboot if the mouse is not hovered over any user interface element. If the mouse is over a user interface element, this text changes to give a tip to indicate the function of the element. 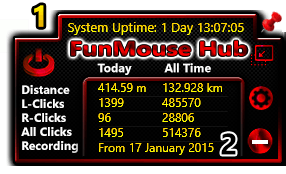 Displays the date FunMouse first started recording statistics about your mouse. When you click on this date, you have the option of resetting this date to the current system date as well as all other statistics to zero. Exit FunMouse and remove the program from memory. Indicates the information hub is unpinned and will close in 5 seconds. Indicates the hub is pinned and stay open till the user unpin or minimizes it. Minimizes the information hub to the system tray. Opens the FunMouse settings program. Indicates that all of FunMouse's functions are enabled. Click to disable FunMouse. To quickly disable FunMouse, hold in the Alt key on your keyboard and perform a left-click. This is especially useful when for example you are in a full screen game and FunMouse interferes. Indicates that all of FunMouse's functions are disabled. Click to enable FunMouse. To quickly enable FunMouse when it is disabled, hold in the Alt key on your keyboard and click the right mouse button. To temporarily disable all FunMouse functions, hold in the Control key on your keyboard. Any function you perform with your mouse while the Control key is being pressed will perform the default mouse function your mouse performs when FunMouse is not installed. Once you release the Control key all FunMouse functionality will be restored again.